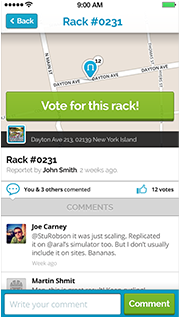 Vote with your wheels and use your route data to improve your community. 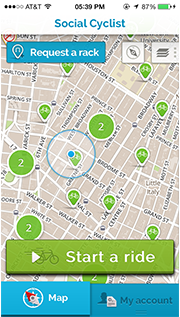 Find bike share stations, report road hazards, set a rendezvous, and more! While Social Cyclist may not be the first route recording app, it's the first to leverage that actionable data on a City-wide scale to improve your community. Vote with your wheels and start recording your rides, report road conditions, request bike parking and request bike share stations. With Social Cyclist, you’ll never need to download another bike share app. Over 7,000 stations from all over the world are displayed with intuitive iconography. Social Cyclists can also report problems with stations to warn fellow riders and alert the operator to a malfunction. Share your journey with other Social Cyclists from Point A to Point B and everywhere in between! 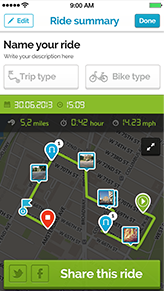 Track rides and metrics, add photos, reports, and post comments along the way. Bring more bike amenities into your community and get feedback from other Social Cyclists! Tell your local agency where to add new bike parking infrastructure and inform your bike share operator where you’d like a bike share station. Corral all your Social Cyclists to a rendezvous point and go on a group ride. 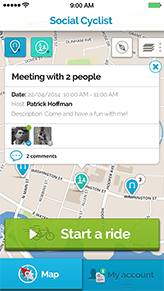 Set a time, place, and location and Social Cyclist will alert you when your fellow riders have arrived. Do you work for a city agency or a bike advocacy organization? Contact us for access to the backend where you can view actionable aggregate data on a corridor by corridor basis. With Social Cyclist ridership data, the days of standing on the street with a pen and paper are over! their cities better for everyone in their community. and we can all ride together!